Middle East Airlines, or MEA, is the flag carrier of Lebanon. It flies to 39 destinations in Asia, Europe, the Middle East and Africa out of Beirut–Rafic Hariri International Airport. MEA does not fly to the United States. The airline’s frequent flyer program, Cedar Miles, generally offers decent redemptions, and it also has some excellent sweet spots. 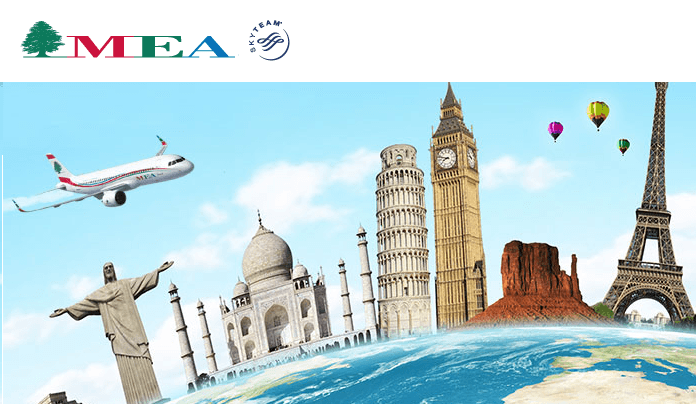 MEA is a SkyTeam member, so your Cedar Miles are good on a large number of partner airlines worldwide. MEA imposes fuel surcharges on its flights, as well as those of some of its partners. The good news is that the airline cut its own fuel surcharges in half in the spring of 2015, when fuel prices dropped. The surcharges are tied to the price of the ticket, and are currently 7.5 percent of the fare. Even at that reduced rate, the fees can be quite expensive on long-haul flights, especially for business class. How Can You Use Cedar Miles? MEA is unique in that it’s a purely international airline. Lebanon is a small country without a domestic airline network. The Cedar Miles program has three redemption charts: one for its own flights, another for SkyTeam members and a third for its nonalliance partner, Qatar Airways. All three charts are region-based. All of the economy class redemptions on the MEA award chart are a decent deal. Business class, or Cedar Class, is not, though, since most of the flights are relatively short. Unless you’re flying to or from Doha, it’s best to avoid redeeming awards on Qatar Airways. Connecting flights through Doha to other destinations are considered separate awards. If you’re heading to Doha, business class round-trip flights from the U.S. are well-priced at 140,000 miles. The Cedar Miles program doesn’t offer a miles-plus-cash option, so you’ll have to have enough miles in your account to cover the entire cost of the award ticket. Cedar Miles members cannot share miles, and it’s difficult to redeem miles for someone else. You have to send a physical letter to the airline requesting the redemption. MEA flights between Beirut and London take about five hours and cost 35,000 miles in economy, and 70,000 miles in business. Although that’s a good redemption rate, the best values are on the SkyTeam award chart. All of South America is lumped into the same region, which means that round-trip flights between the U.S. and Brazil, Argentina or Chile on Delta, Aeromexico or Aerolineas Argentinas cost only 45,000 miles in economy, and 90,000 miles in business. Both are excellent values that beat the redemption rates offered by Delta, United or American. The SkyTeam award chart. Prices are for economy class in thousands of miles. 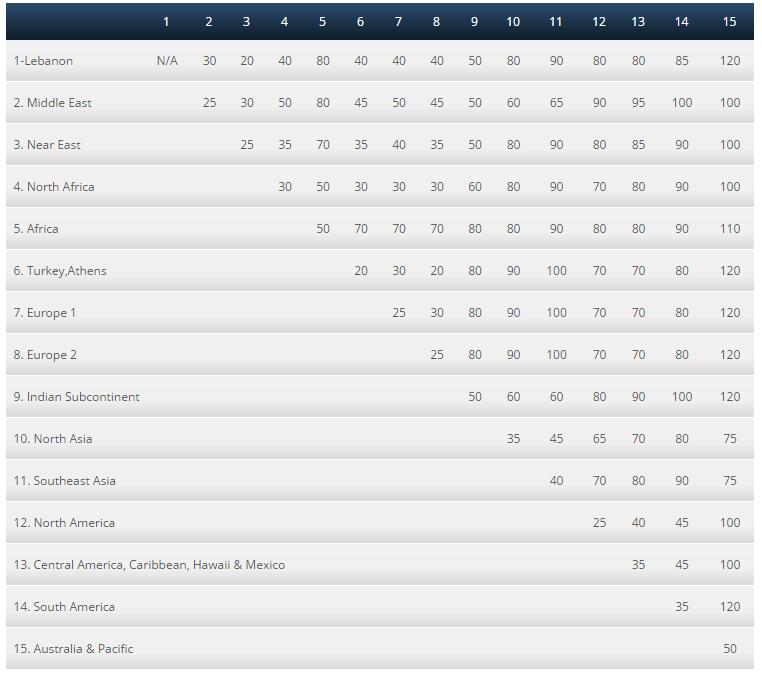 Also on the SkyTeam award chart, Hawaii is in the same region as Central America, the Caribbean and Mexico. That means that you can fly between Hawaii and any of those destinations for only 35,000 miles in economy, and 70,000 miles in business. Russia is another area that offers bargains. Eastern Russia, which is everything east of the Ural Mountains, is part of the North Asia region. So you can fly from the U.S. to Vladivostok or Petropavlosk-Kamchatsky for only 65,000 miles in economy, or 130,000 miles in business. That’s less than it costs to get to Moscow, which costs 70,000 in economy, and 140,000 miles in business. Award flights on SkyTeam members between the Australia and Pacific region and Europe are expensive at 120,000 miles in economy and 240,000 miles in business. On MEA, flights between Gulf countries and Africa are overpriced at 80,000 miles in economy and 160,000 miles in business. You can only purchases upgrades with miles on MEA flights. You can upgrade from economy to business class, and the cost is determined by the flight’s origin and destination. There are no MEA credit cards available for U.S. residents.